We told you earlier this week that word was that Alabama head coach Nick Saban was preturbed over the situation, and not at Cyrus. It seems Jones found himself in an altercation with a female, and in an attempt to resolve the situation peacefully contacted the authorities himself. But instead of resolve, Jones found himself at the center of headlines and media jabs from all over the country. Simply, domestic violence is such a serious issue, but reform has to be instilled in this volatile subject. Not everything is an act of domestic abuse, certainly not damage to a cell phone (intentional, or unintentional, whatever the case may be). But just as serious, how can a coach of 18-22 year old young men, most of them minorities, lead them to cooperate with authorities, if, when they do, they are harrassed, arrested, embarrassed, and made the center of media scrutiny? We’ve said it here before, and I’ll say it again. There seems to be a real problem in Tuscaloosa with the relationship between the police department and the football program. Just as you could in the Tony Brown, Simeon Castille, and Rashaad Johnson arrests, you can file this one in the “fumble by the Tuscaloosa PD” category. The question now is, how hard will mediots at ESPN and within the state of Alabama now work to clear the names of Cyrus Jones and Alabama football…in comparison to how hard they worked to use them for quick, cheap headlines on Tuesday of this week? How hard will they work to erase the cloud permanently installed over the young man as he looks ahead to interviews with NFL teams concerned about character next spring? I’m not a betting man, but my wager is, “not very hard.” And in this situation, THAT is the crime. 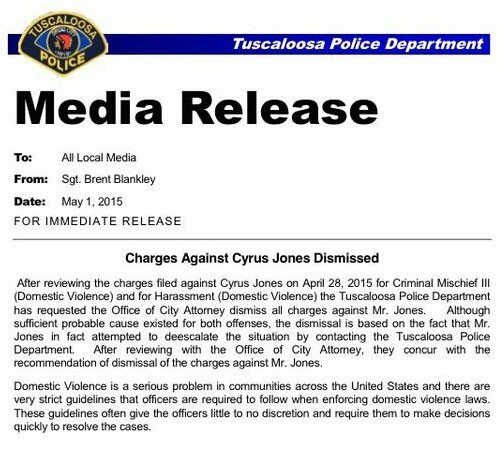 Not, according to the Tuscaloosa PD, is anything Cyrus Jones did. Separator image Posted in Alabama Football News, Capstone Saturdays, Commentary and tagged with Alabama football news, Cyrus Jones charged dropped. How come we havent heard anything about the Duke Williams tweets? Seems hes not too sure of wether hes gonna stick around the barn yard or not!